The Hotel of Horror and Altered Nightmares Halloween Attractions are both housed inside the Lake House Hotel intertwined and breathing next to one another, sharing organs and a circulatory system like conjoined twins. The sinister subconscious of the Hotel of Horror feeds off the dark energy that stains the lumber skeleton of this once pristine mountain resort, while Altered Nightmares celebrates the chaos that grows stronger as each soul travels through its decaying halls and abandoned rooms. Please enter with caution as the inmates run this asylum. This 2013 will celebrate the 21st year that The Hotel of Horror has been fascinating and horrifying legions of fans from the far reaches of The United States and even internationally. Witness for yourself why we are critically acclaimed. See Also Hotel of Horror for details on the sibling attraction! The Hotel of Horror and Altered Nightmares Haunted Houses and Exhibition Macabre Museum are all imprisoned inside the Legendary Abandoned Lake House Hotel in historic Saylorsburg, Pennsylvania. The Lake House history spans over more than 200 years and justifies the dark and sinister back drop of the modern horror attractions that currently infest the walls today. The tales begin with the original stage coach stop, circa late 1700s whose foundation only remains, sheathing the walls of the furthest basement rooms under the encapsulated Victorian mansion. The destruction of that original stage coach stop gave birth to a tavern referred to at the time as The Saylorsburg Hotel, an Inn for Travelers, built by Charles Saylor in 1847. Over the course of the following 53 years it saw much expansion and construction. The first rebirth of the Saylorsburg Hotel came around 1882 to 1888 with the coming of the railroad, removing the roof, building a third story, and renovating the exterior to celebrate the wonderful architecture of the Victorian Era. This remarkable mansion still exists inside the grand hotel addition built sometime between 1894 to 1900, and remains the same in size that you see today. The Hotel hosted the entire Monroe County Battalion of 6 companies of soldiers during the Civil War and was also used a residence seeing its share of births and deaths. The local mines and railway used the Hotel at several points in its early history to house their business operations as well as the infirmary and place of pick- up for the next of kin when tragic accidents would occur. It is recorded that many men died on its front porch waiting for family to arrive after suffering major injuries in those local mines and railway construction. In October 1918 the local press reported that the Spanish Influenza had arrived in the Pocono Mountains, bringing sickness and death. The recently built county hospital was inadequate and temporary hospitals were established in local resorts surrounding Stroudsburg. Then in 1929, again in October- just a few days before Halloween, investors in New York City began to panic- stocks bought high began to drop and so the Great Crash of The New York Stock Exchange devastated the economy. It is recorded that guests of the Lake House, having left New York in shame and despair, not knowing how to provide for their families, checked into the Hotel, had drinks in the bar, dinner in the dining room, and saw there final night on earth in the guest rooms on the second and third floors. It was at that time that Saylorsburg, Pennsylvania became known as The Place to Hang Yourself. In the late 1940s and 1950s the basement area had become home to Vickie Lee Blouse Company, employing ladies who worked on rudimentary textile equipment with minimum safety precautions. It can only be imagined the injuries suffered in the lower level of the Lake House Hotel during this time. After the close of this company the lower level saw use as a barber shop and then a state liquor license permitted the serving of alcoholic beverages in this same lower level, in addition to the first floor bar. The basement was turned into a marine themed bar and in 1985 a failed robbery attempt left the owner of that time totally incapacitated and resulted in the hotel closing for good. 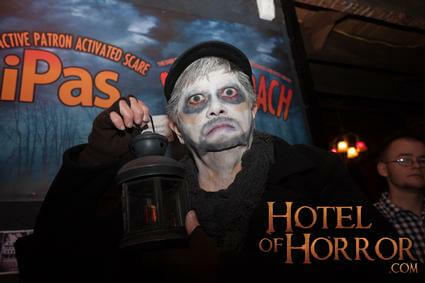 It was purchased in 1990 and turned into an Antique Co-Op, and then in 1992 saw its first Haunted House Attraction. Halloween 2017 will make 25- 200 years of Horror. The Hotel of Horror Attraction: Stricken- Where the Inmates Have Over Run the Asylum. The Altered Nightmares Attraction: Spellbound- Walk Through a World of Mystery. The Exhibition Macabre- The static display's of history's experiments in practicing medicine, preparing the dead, memorializing life. Reality in it's darkest hour. Coffin Coach Activity: The Dark Ride that takes you on your own afterlife experience and back again. iPas Gaming Activity: Be the Haunter instead of the haunted. Trigger selected animatronics to terrify the unsuspecting passing through the attractions. The third state of the art attraction also housed inside the Legendary and Abandoned Lake House Hotel in historic Saylorsburg, Pennsylvania is the Exhibition Macabre. This museum is not your average tour. Visit with our seasoned host and see the static displays of history's experiments in practicing medicine,preparing the dead, memorializing life. Reality in it's darkest hour. These authentic antiques- medical, dental, funeral, asylum and penitentiary, are housed inside the original front parlor and a portion of the original bar accessible through the original front entrance of this once grand hotel. Tickets are available through the box office only, and are sold every night that we are open to the public. This is a magnificent add on to your Halloween Experience that is sure to not be missed- we promise you will not see anything else like this. 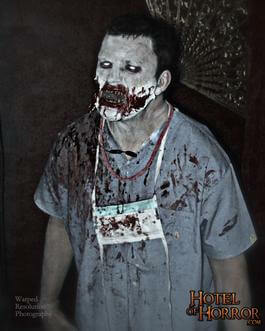 © 2012 HauntedHouseAssociation.org | All Rights Reserved.